Shark teeth are sometimes the only fossils found of these marine animals because most of their skeleton is made of cartilage. 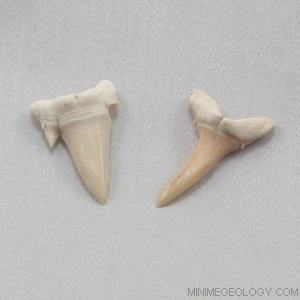 These Eocene age shark teeth are approximately 38 to 54 million years old from a variety of species. You will enjoy this set of four fossil shark teeth from locations in Morocco. An information card with details on the shark teeth is included. Typical samples sizes are generally 0.5 to 1.0 inches in length or width but can vary based on availability and natural fossil shape.